Earlier today, Trump took to Twitter to insist that the summit had been a success. DONALD TRUMP HAS claimed that no US president has been as “tough” as him on Russia as he sought to squelch criticism over his failure to confront Vladimir Putin at the Helsinki summit over election meddling. But the US leader – who was criticised yesterday for his convoluted efforts to explain away his comments about the Russian president – again courted controversy when he appeared to suggest Moscow was no longer a threat. “And I think President Putin knows that better than anybody,” Trump said. “He understands it, and he’s not happy about it. But when asked if Russia was still targeting the United States, Trump clearly appeared to reply “no” – an assertion that would contradict the assessment of US intelligence chief Dan Coats, who said on Monday that Russia was involved in “ongoing, pervasive efforts to undermine our democracy”. She said the threat to the US electoral system “still exists, which is why we are taking steps to prevent it”. 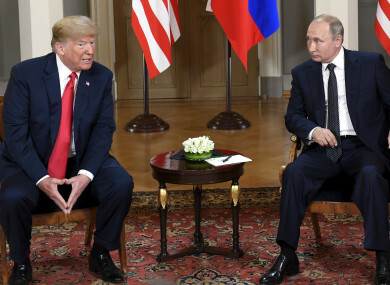 Democrats and some members of Trump’s own Republican party have criticised him for accepting at face value Putin’s denial that Russia interfered in the 2016 vote to undermine Democratic candidate Hillary Clinton. The US intelligence community has repeatedly said the contrary. Democrats say the woman who translated for Trump – and the notes she likely took – could provide critical information about the meeting. Earlier today, Trump took to Twitter to insist that the summit had been a success, citing the “many positive things” he expects to come from the meeting. “While the NATO meeting in Brussels was an acknowledged triumph, with billions of dollars more being put up by member countries at a faster pace, the meeting with Russia may prove to be, in the long run, an even greater success,” Trump tweeted ahead of the cabinet meeting. “So many people at the higher ends of intelligence loved my press conference performance in Helsinki,” Trump said. Faced with outrage at home, Trump said yesterday that he accepted the intelligence community’s assessment that Russia had meddled in the election. He also offered a convoluted explanation of his assertion that he could not see “any reason” why Russia would interfere, claiming he misspoke. “In a key sentence in my remarks, I said the word ‘would’ instead of ‘wouldn’t',” Trump said. The president has dubbed it a “witch hunt”, and repeatedly denied any collusion. But the investigation is progressing, as evidenced by the indictment of 12 Russian military intelligence agents on Friday – timing that was embarrassing ahead of the summit. Email “Trump says no US president has been as 'tough' as him on Russia ”. Feedback on “Trump says no US president has been as 'tough' as him on Russia ”.